We have an Elton Games Camel Race machine in very good condition available for immediate shipment. It is a simple yet enthralling game where players roll their balls into a set of target holes to power their racing character and win the race. The speed and progression of the race is determined by the skill of the players in targeting the holes. The game has high repeat value as the players cannot wait for the next race to start, always confident that they can win. 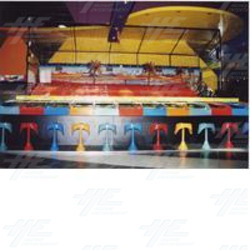 This is a reconditioned machine and can be upgraded to different themes. For more information contact "> .